Jelly, the newest question and answer service on the block, is looking to take on the likes of Quora and Yahoo Answers by baking social features directly into its DNA. In some circles, it’s being described as a search engine, but it doesn’t function as one in the way that we know and use them today. It’s no surprise that Jelly has tight social integration at its core either, with Biz Stone, co-founder of Twitter, behind the project it would have been more surprising if it hadn’t. But while Jelly’s launch has been teased for a long time, it isn’t quite what some people were expecting. For now though, it has only been one day since it launched, so we’re willing to give it a little time to see if it can transform into a truly useful tool, or whether it will gradually fade away like so many others. Jelly is available for iOS and Android (the version tested here), and is available to download for free from the respective App Store and Google Play repositories. To get started, you just need to connect it to either Facebook or Twitter (or both if you like). For anyone who is hesitant to connect endless services to their social accounts, you’ll be pleased to hear that Jelly doesn’t actually post questions you ask, or responses you give, to the connected networks automatically – although there are ways of sharing questions and responses to social channels manually. Once you’ve signed in by connecting at least one account, you’ll see a question appear with an image and the profile picture (pulled from the respective social network) of the person asking the question. One advantage Jelly brings to the table is not only connecting you to people you know, but also to friends of friends, far expanding the reach of any question you ask. When posed with a question, you get the option to answer it, forward it on to a friend, or simply swipe downwards on the screen to dismiss it forever. If there are responses, they’re shown in a tab at the bottom of the screen, tapping it brings up the answers that have been submitted so far. If there is more than one response swiping right-to-left brings up the more recent entries. This could actually have been made a little clearer for new users to the app. You also get the option to ‘star’ that question in the top-right hand corner, doing so means you’ll receive a notification if the question is answered. You can see in the screenshots above that your connection to the person asking and answering the questions is clearly shown, so you have a better idea of where responses are coming from, whether that’s on a question you’ve posed or one asked by someone else. When you find a question you’d like to answer, simply hit the Answer button and type your response. As well as responding with text, you can also add a link to a specific URL into your answer and draw a response on the originally posted image (below, right). If you like someone else’s response, you can mark it as Good or share it (using the button) via other means, this is still a bit clunky though – it essentially just says someone received a good response on Jelly and includes a link to the Web page where it can be viewed. The option to share beyond Jelly’s own network (via email, other social networks, IM, or any other app you use to share things via your phone) and allow questions to be answered via the Web (shown below) is another savvy decision – not only does it increase interaction among current users of the network, it also opens up the potential to extend it far beyond Jelly’s install base. The Web interface, like on the app, gives respondents the option to type or draw an answer. If the person who shared it with you was misguided in thinking you could help, you can always just click the ‘Can’t help’ button. Asking your own question is a cinch too. 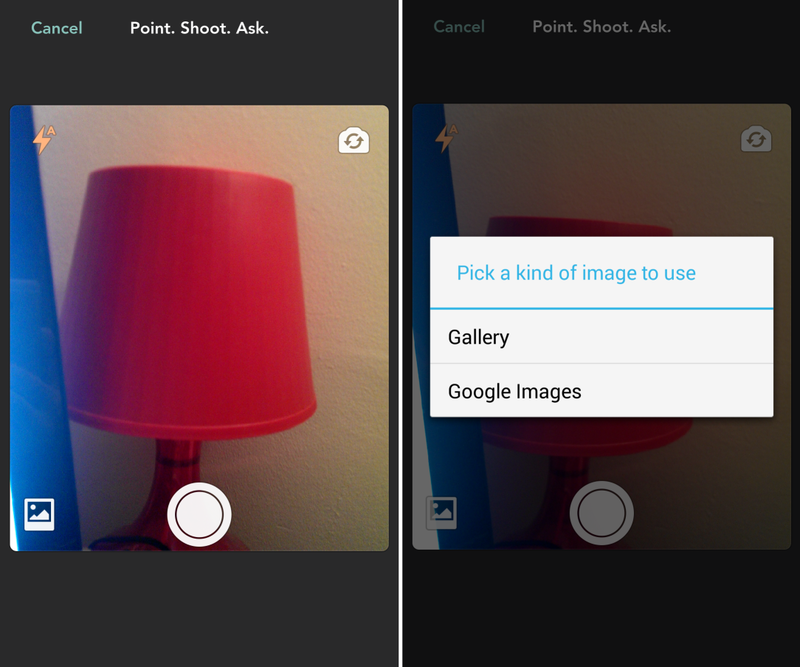 Just tap the camera icon that is persistently accessible in the top-right throughout most screens of the app and a viewfinder screen pops up presenting you with the option to post your question with a photo, post with an image stored on your phone, or post with an image found via a Google Image search. Posting a question without an image isn’t possible, most likely as questions asked without an image are unlikely to receive a response, and nothing would scream ‘fad’ like a network with lots of questions but very few answers. Thankfully, that doesn’t seem to be the case right now. I posed my own question (shown below) about what type of dog might be suitable for someone living in London in a flat with a garden (and one about what kind of bush was in said garden) and got a flood of responses. Posting it with a picture of cute puppies probably helped. For the record, several people suggested getting a cat instead. In among the inevitable jokes about getting a sausage dog or “one that doesn’t crap outside my garage”, there were some considered responses, giving an inkling of how useful Jelly could be. Once you’ve received a reply, you get the option to show your gratitude by clicking the Thanks button, or to share it. 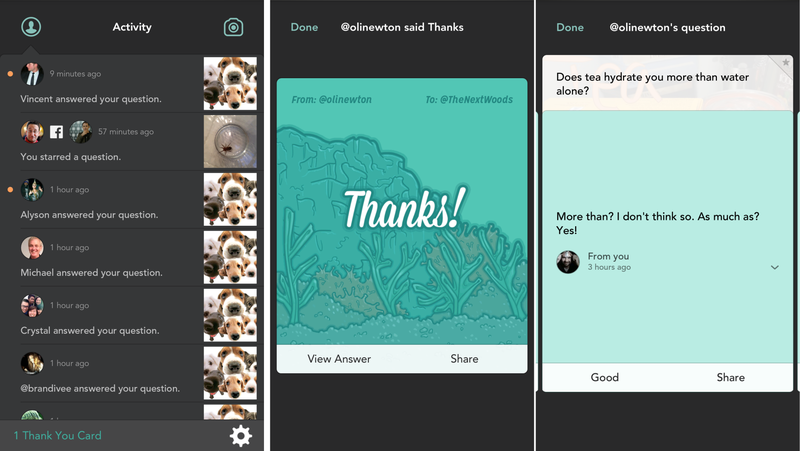 In order to keep track of questions you’ve posed, responses you’ve received and answers you have left for other people, there’s an Activity tab, accessible by tapping the person icon in the top-left of the main question screen. At the bottom, there’s also a counter indicating how many expressions of thanks you’ve received, but tapping on it doesn’t take you to a list. If you want to find it, you’ll need to trawl through the activity tab, and then access it that way. If you can’t even remember what you are being thanked for, there’s the option to click through and see your answer. Much as I like Jelly, it (unsurprisingly) isn’t perfect and there are a few features that I’d expect to see added sooner, rather than later. For example, there’s no question filter so you can put your knowledge to best use; if you don’t know an answer you simply dismiss it and are shown the next in the list, which isn’t a very efficient way to do things, but is perhaps sensible while a service is in its infancy – a range of predefined and empty categories wouldn’t help things much at this point, but some filtering options would be nice. Similarly, filtering options for the activity tab are a must – the option to view questions you’ve asked, thanks received or responses received by type would speed things up no end. There’s also no provision to respond to responses that have been given, which is another feature that would help Jelly grow in usefulness by enabling an interactive back and forth. Truly useful or soon to be forgotten? How useful Jelly can be really is down to you. If you choose to ask it silly questions, you’ll get silly and jokey responses. And a fair few of them. However, ask it a sensible question and it looks like you’ll find some genuinely useful advice being passed along in among the quips. I was actually surprised at how sensible and swift some of the responses were. Whether this active user base continues to be the case once the press attention for Jelly has died down a bit will be the real proving ground for the company. There are also other questions about monetization which are still up in the air, for now though, Jelly is a free, non-ad supported service. Sooner or later though, Jelly will need to make some cash, and how it achieves this will be central to its long-term success. Many companies have struggled to monetize a previously free service in a way that didn’t annoy their existing users. 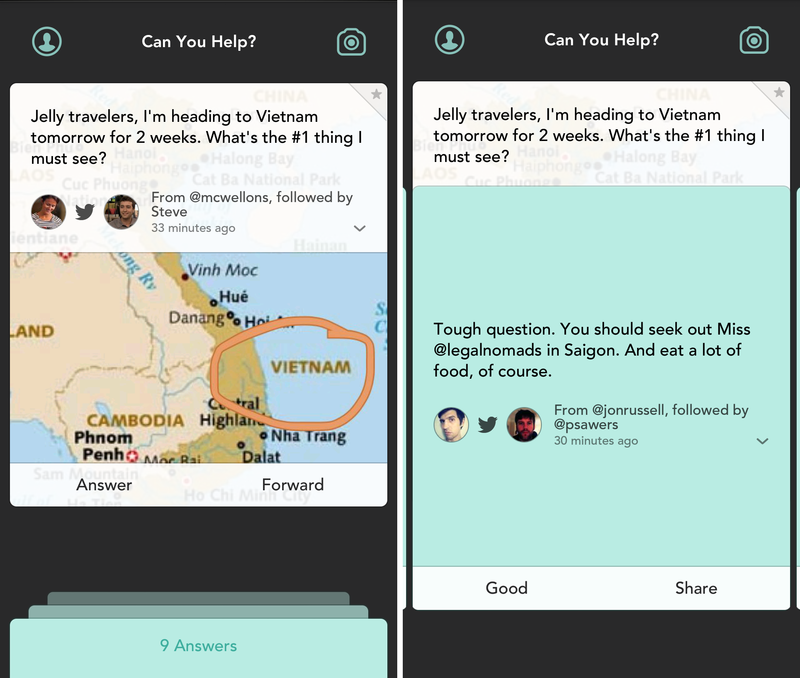 For now though, Jelly is a free fledgling Q&A service with a with a very well known founder, a beautifully simple UI and aspirations of becoming as useful a tool as Google Search for answering questions. 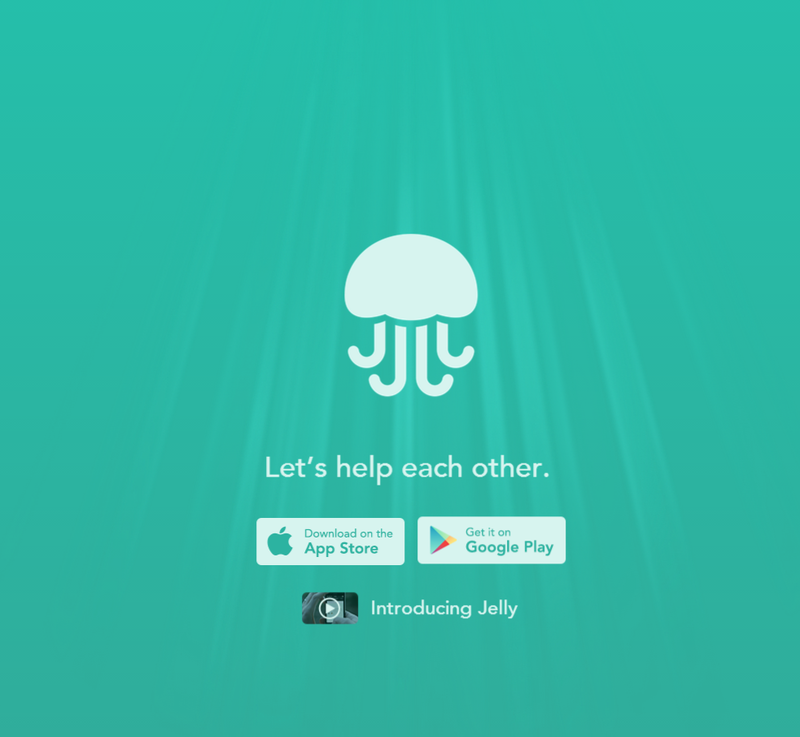 Was Jelly an over-hyped app launch that could lend itself to silly questions rather than useful ones? Perhaps, but we haven’t seen its true potential yet, and most of that potential lies in its user base.